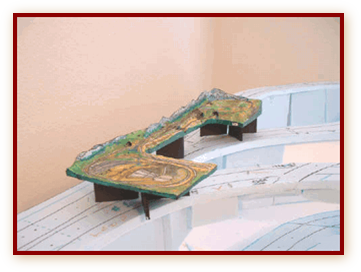 This HO scale model railroad was inspired by the Rocky Mountain railroads of the late 19th and early 20th centuries. The SJSRR or "The Silver San Juan" (That nick-name is certainly not original with us but more commonly associated with the Rio Grande Southern.) is a "freelance" layout based on what little RR and prototype knowledge the builder has at any given time. The time period is the mid 1940's and the SJSRR serves regional mining and lumber industries and interchanges with the D&RGW which is the source of many of the necessities of life and commerce for the San Juan area. 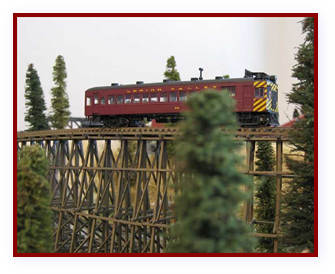 The main purpose of this model railroad, other than generating enough revenue to keep the trains rolling, is to create a pleasing "diorama" of the Rockies in the San Juan area and to have fun in the process. The layout is only 6' X 17' and is a sort of "dog bone" configuration with two end modules connected by two 4-1/2' X 1-1/2' modules. Copyright� 2001 - 2013 Jack W. Murray, Jr.
Control is Atlas Commander DCC with two walk-around Handcommand throttles. Digitrax and Lenz decoders are used. We do not have sound, yet. controlled by Digitrax and MRC auto-reversing modules. details are still to be added as well as block detectors (NCE BD20) for the hidden trackage and finished switch control panels. Please browse around and email us from the Links page if you have comments or questions. Thanks for looking in! Follow the menu for a look at building the layout. The SJSRR serves a mine, sawmill, and box factory and ore processing plant. It also supplies the town (Name?) and lumber camps. Interchanges with DRGW in 1940's. Uses RGS and DRGW equipment. Mixed trains, tourist excursions and local freights. 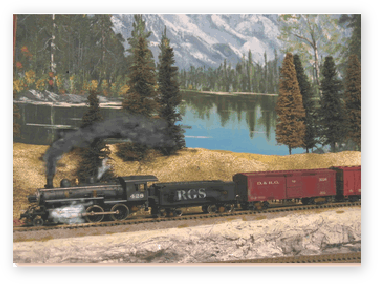 DRGW brings coal, materials (lumber and machinery) and foodstuffs and mercantile to SJSRR. Locals carry reefers and boxes to mining and lumber camps. Locals bring lumber and ore to sawmill and ore plant in or near town. Engine facilities including roundhouse, sanding, maintenance track in town near passenger/freight depot. Thank you Veterans and All Service Men and Women and their Families!